It just happened that I was so unproductive yesterday in the office so I thought of diggin’ out some old photos (to get some inspiration) and clicked on a folder named Maldives. Well, I just mentioned my unromantic love story just a bit earlier right? 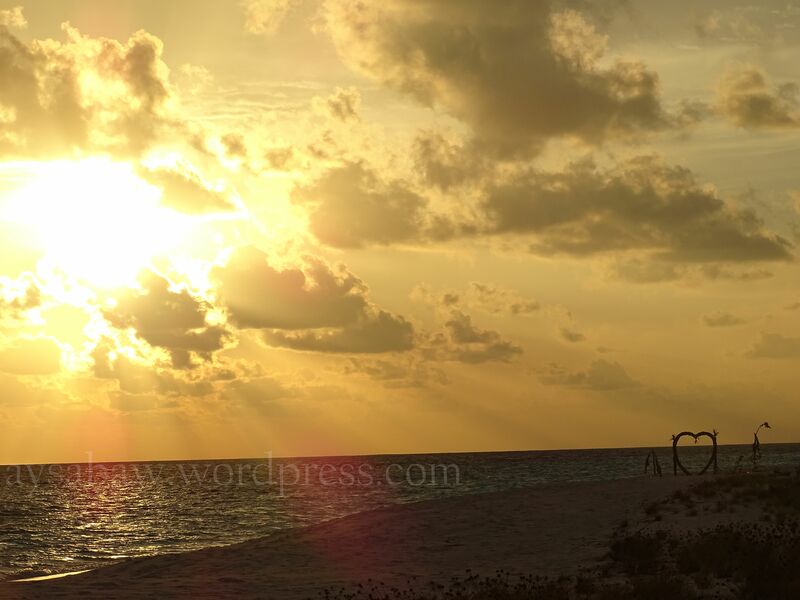 The love story was really quite old and I got married last year(already), of course without posting about it but now, I’m not saying that this is the right time to post it but I can’t post about my trip to Maldives without mentioning it. 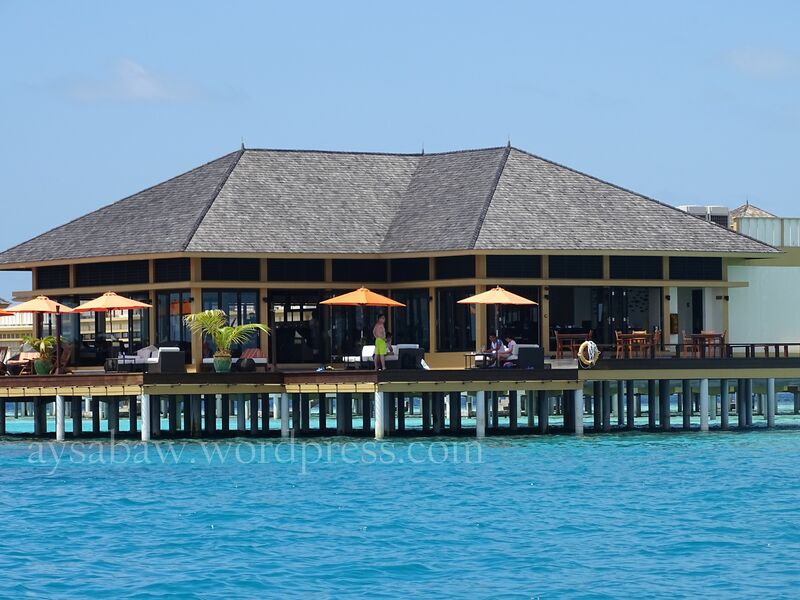 So, the day I (we) got married last year is the same day that we flew to Maldives. 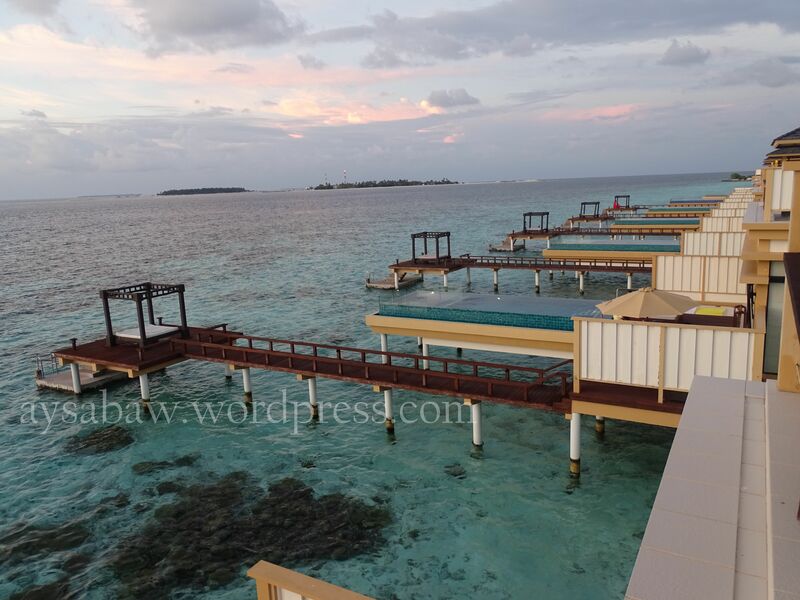 It’s just a four-hour flight from Dubai but because we took a cheap connecting flight, it took us more hours to reach Maldives but anyhow, it is worth the long (waiting) hours. 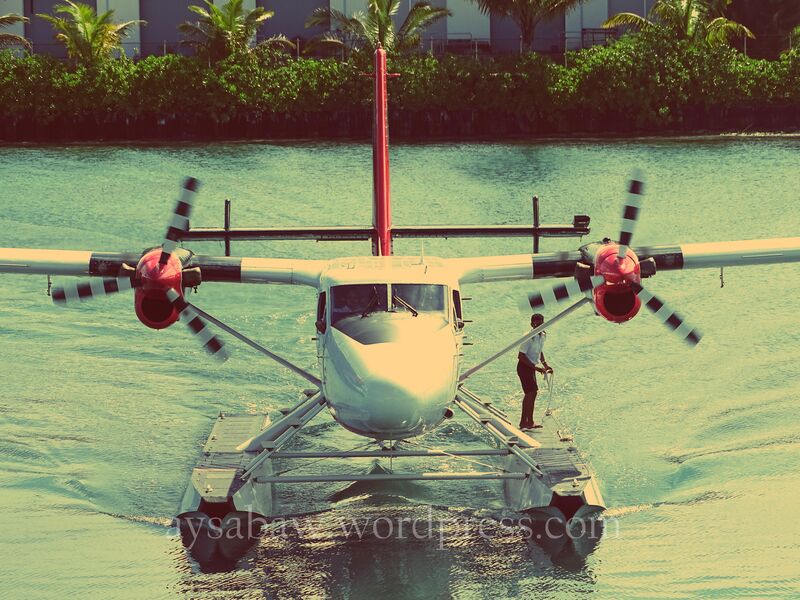 When we reached Male, we were greeted by the hotel representatives and were escorted to the Seaplane Terminal. We waited for about 20-30 minutes before we got into the seaplane. There are hotels that can be reached by speed boat from Male but we are heading further South so we had to take the sea plane. 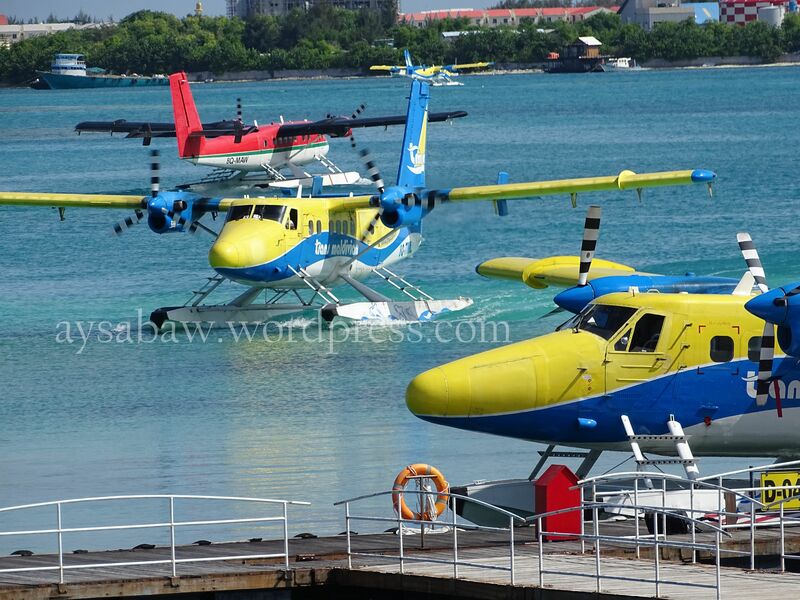 These seaplanes could hurt your ears, they are just too loud. It took us about 45 minutes to reach the resort. Though I must say that the ear-hurt is worth the amazing aerial view. 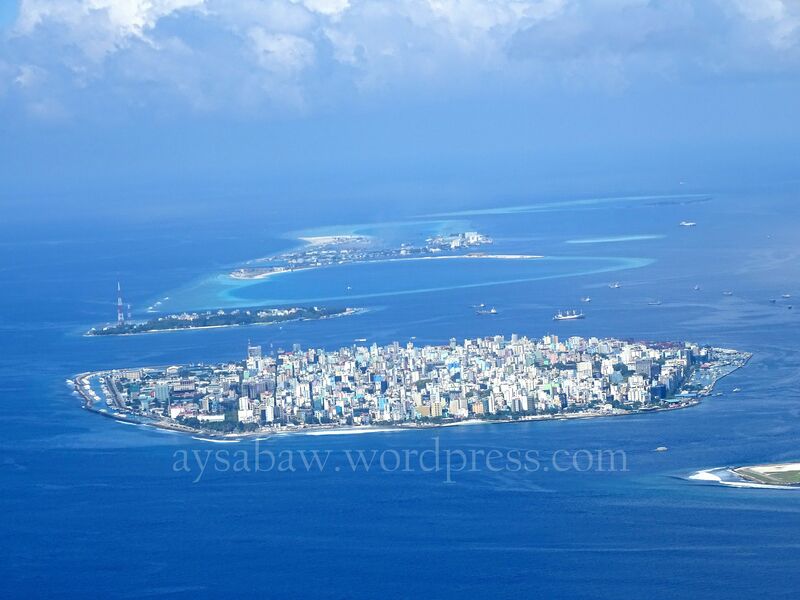 This is Male, the capital of Maldives. It looks like a post card, if you’re looking at it from the seaplane. So, after 45 minutes of ear-hurting and sight-seeing, we arrived at the resort. 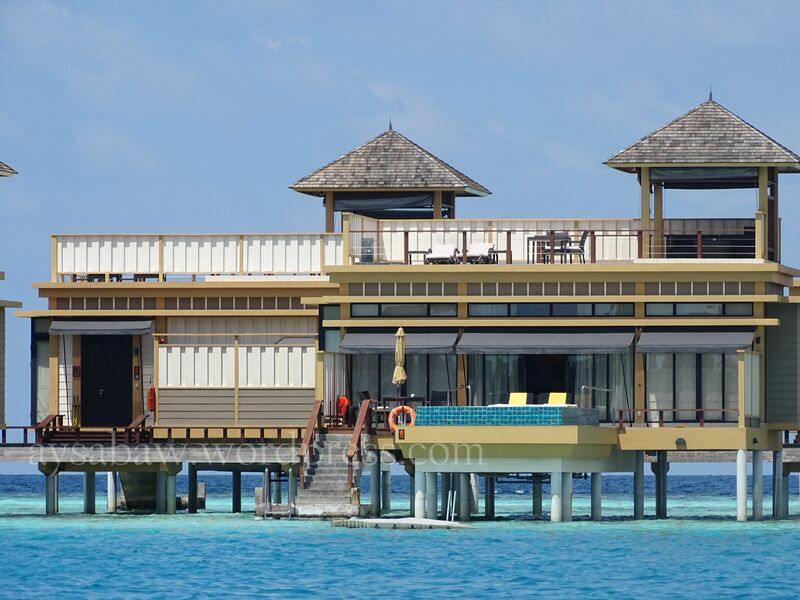 Angsana Velavaru offered us a lovely In-Ocean Villa, built on top of the water, with amazing views of the horizon, the sun, the sea and the sky. The villa has its own pool, verranda or terrace or however you may call it. 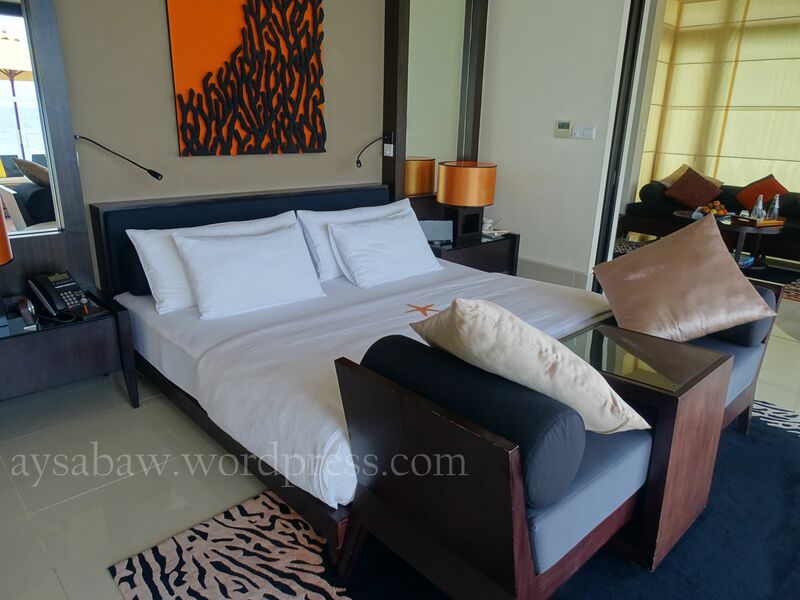 It also has a 2nd floor which offers you an amazing view of…of everything. You can also have your spa treatment or breakfast or lunch or dinner or barbeques on the 2nd level, your choice. 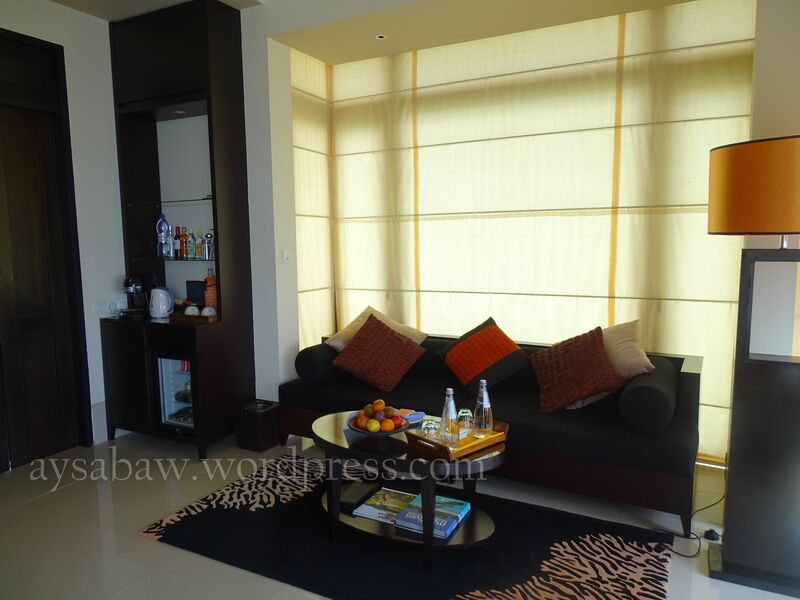 As I said, the 2nd level offers you the view of everything which includes your neighbors. And oops, I think that’s me, the mermaid on the pool. It is just amazing that even though you are not a professional snorkeler or even if you can’t even swim, you can snorkel. Does that make sense? LOL. Anyway, the thing is, you can just go down from the jetty and walla! You can see all sorts of corals and fish and small sharks. See, that’s my husband on the picture. He can’t swim. He doesn’t even know how to float. But then because the water is just waist-deep and you can borrow the goggles and the life jacket from the resort’s marine center, you can then feel just like a pro. Just sad that our camera isn’t water proof. 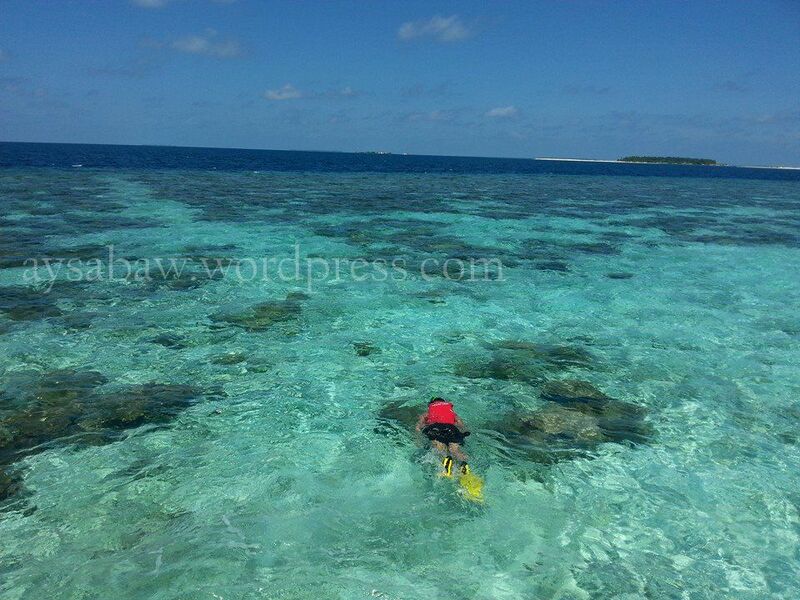 We could have taken photos of the corals and fish and small sharks swimming around. 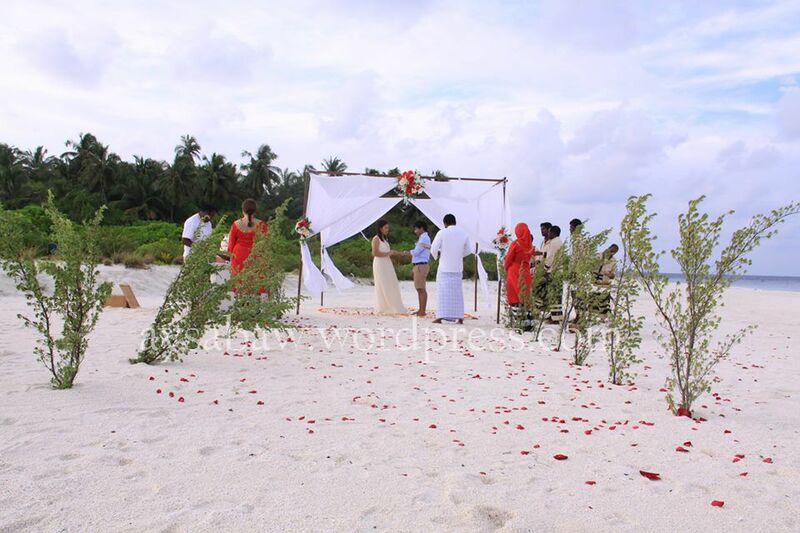 Ok, so the hotel team knew that we just got married so they arranged a Maldivian Wedding Ceremony for me and my husband. They knocked our doors around 3pm, gave me a bouquet and we started walking from our villa to the jetty with some guys singing Maldivian songs to the beat of their loud drums. So all our neighbors walked out of their villas and watched us as we walk through the alley with all these Maldivian peeps walking with us, singing and, making loud noises drum beats. When we reached the jetty, a speed boat was waiting for us and they took us to the hotel’s main island to do some coconut planting which is also part of the ceremony. They said, the tree will be named after us so when we come back sometime in the future we could see how the tree has grown. Afterwards, they took us to a private island via the speedboat and there, we did the actual wedding ceremony, the I do’s and I don’ts. And after the ceremony, the team left us with a chef and a waiter. So basically there were just four of us in the whole island. I felt a little bit like Chuck Noland and Wilson for a few hours. 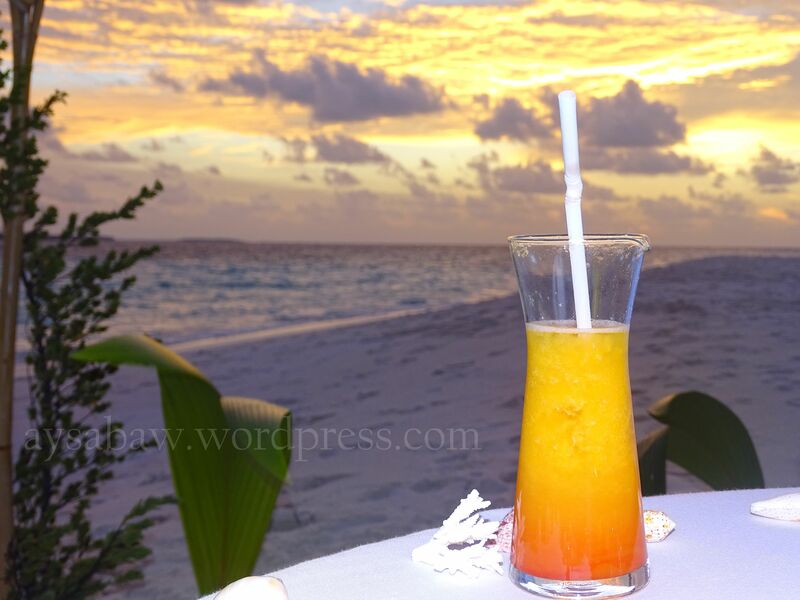 The friendly chef and waiter served us a nice sunset dinner by the beach. The next day morning, we booked for an early morning fishing trip. We were so excited to see the sun rise and to go out to the sea as early as that. I told my husband “Aria! Walang kakain hangga’t walang nahuhuling isda!’ And we both laughed. We tried, but we didn’t get any fish. We were sad. The water was so clear that we could see tons of fish eating our baits but not getting hooked up( and how did this sound? *_*). We went back to the villa with teary eyes but with a conviction that we will try to fish once more in the evening and won’t come back without any fish in our hands. We spent the rest of the day snorkeling again and had lunch (didn’t I say walang kakain hangga’t walang nahuhuling isda? but we did anyway) in one of the restaurants, Azuro. Seriously, I can sit here, drinking watermelon juice (?!) till the sun sets every day for a week or more…. just like this. So, afternoon came and we prepared to go fishing again. We left the island at sunset and reached the middle of nowhere after the sun has set. You can catch all sorts of things here in the Indian Ocean, really. Emily, the Chinese staff of the hotel went with us and caught a medium size shark, maybe 4 feet long. At first, we didn’t know it was a shark but we knew it was heavy. 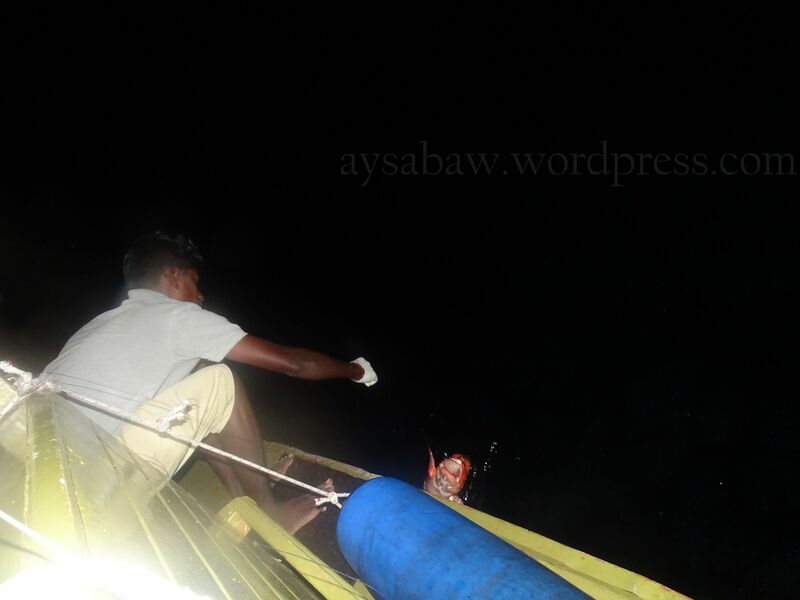 It took 3 guys to pull it up on the boat and of course in the end, we had to let the poor shark go. One of the Chinese guests caught something very heavy too. He cried for help. At first we thought it might be a shark again (oh how blessed the trip was!) but then when it was finally pulled up, it was a huge coral reef. I asked myself, just how did his fishing strings reached the bottom of the sea when we were in the middle of nowhere? Could his strings be longer than mine? So after an hour in the middle of the dark sky and dark blue waters I started to feel depressed. My husband caught 2 fisheses already and the other guests inside the boat also had something on their buckets already but I still haven’t got a single one. But then patience is a virtue. I remembered a book that I have read a longggggg time ago called The Longest Silence which is about fishing and surely from the title itself, you’ll know what it means or what the book is all about. I felt some movement on my bait. I gently pulled it up and down and up and down and suddenly I thought I would fall off the boat as it pulled me, really hard. I pulled. And it pulled back. It was so heavy and as again I pulled the strings towards me it pulled back harder and my hands got red and the nylon strings started to hurt my fingers. I shouted. Help! So this kind Maldivian guy took over the push and pull situation that I was in and even he had some difficulties in pulling this thing. And when the grace of the sea finally reached the boat, it was a beauty. I only caught one, but I caught the largest fish of the night. 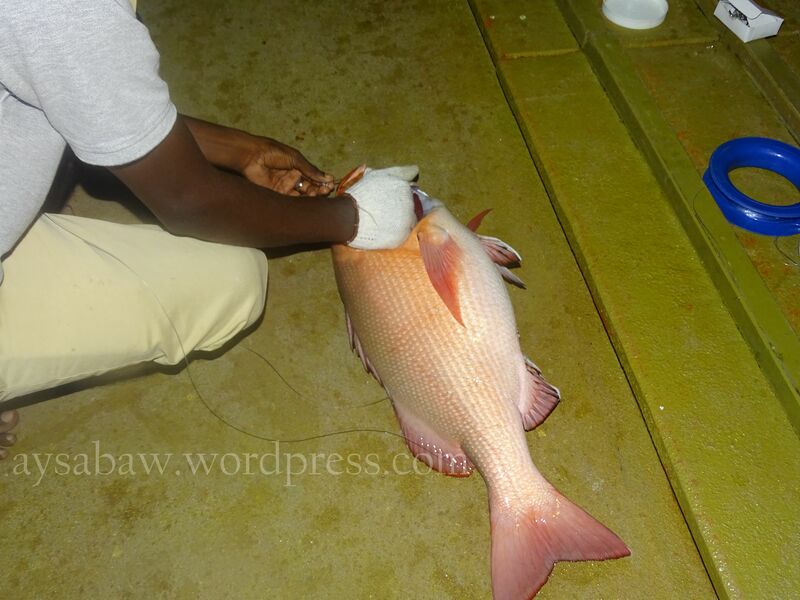 A huge Red Snapper. And this is what all of us got for the night. 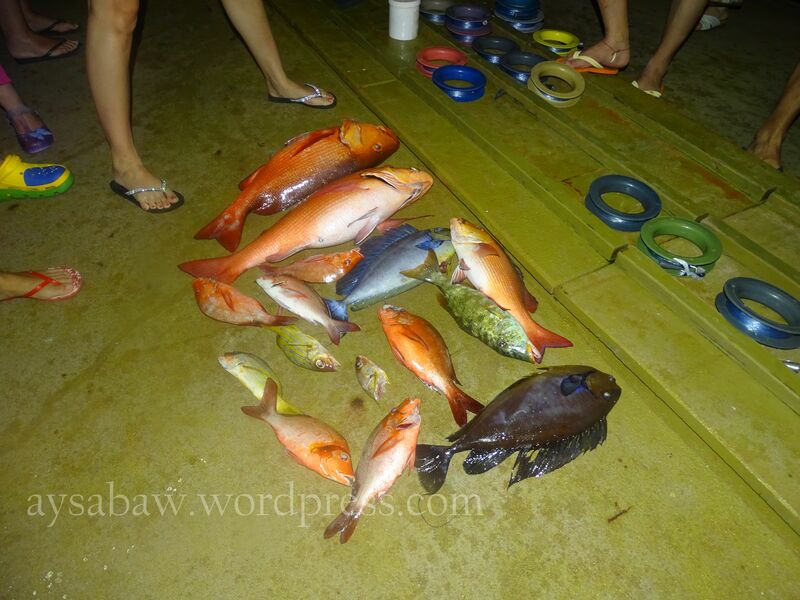 The nice blue fish in the middle was my husband’s catch (and some other smaller ones). Then you might ask what will happen to the fisheses that we caught? The answer is a nice and fresh seafood meal the next day. Either grilled, steamed, fried, with szechuan or soy or garlic or sweet and sour sauce, our choice. I was almost on tears when the staff waved their goodbyes to us and sent us off to the seaplane. I’m sorry for the unromanticicity of the post but more than the romance, I enjoyed the whole trip because the place was so serene and that I felt very close to the fish nature. 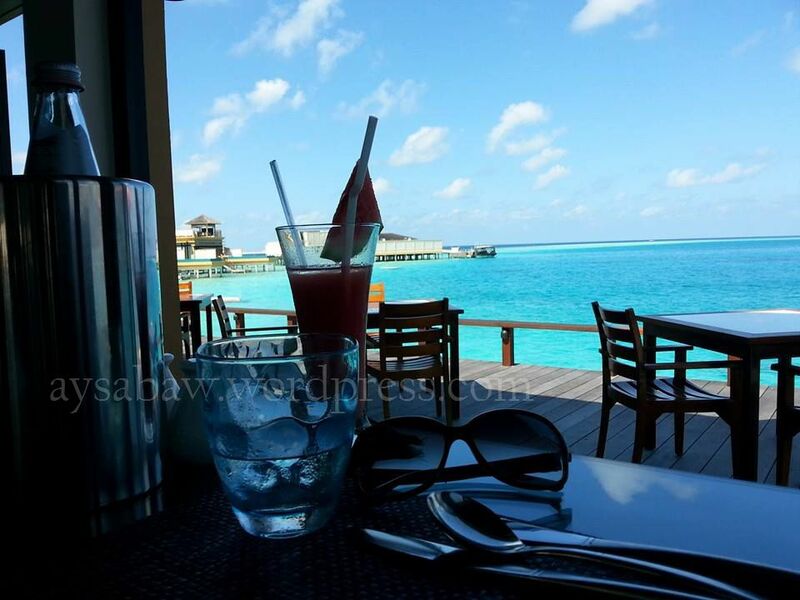 This trip could be expensive but trust me, Maldives is worth its price. 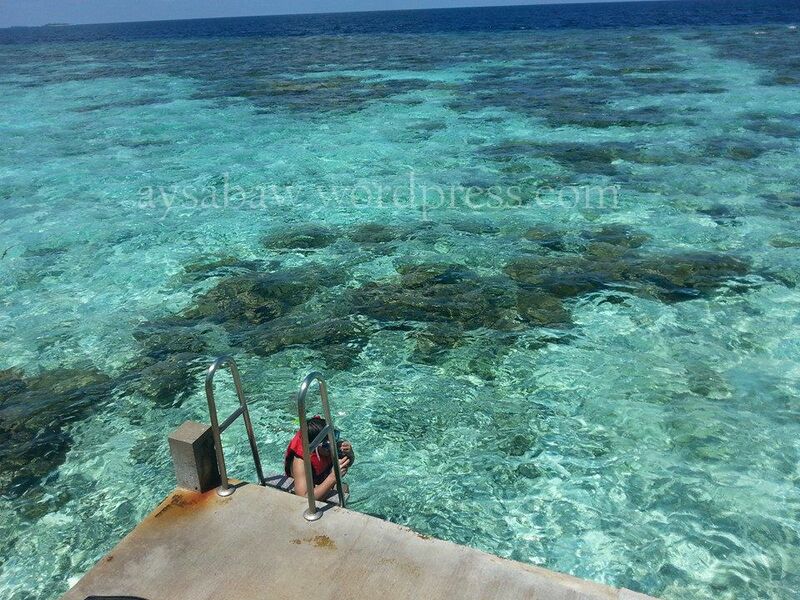 I am dying to go back again to its clear waters and its laid back lifestyle. And so at the end of reminiscing and wanting to go back again to Maldives, I found myself so inspired and dreamy that it didn’t help with my productivity in the office yesterday. Awww ! No close -up wedding pic of the lovey dovey couple ? Oi, Congrats ate! Haha ang gondaaa naman nyang wedding reception nyo ah. Nice! nakakainggit naman! 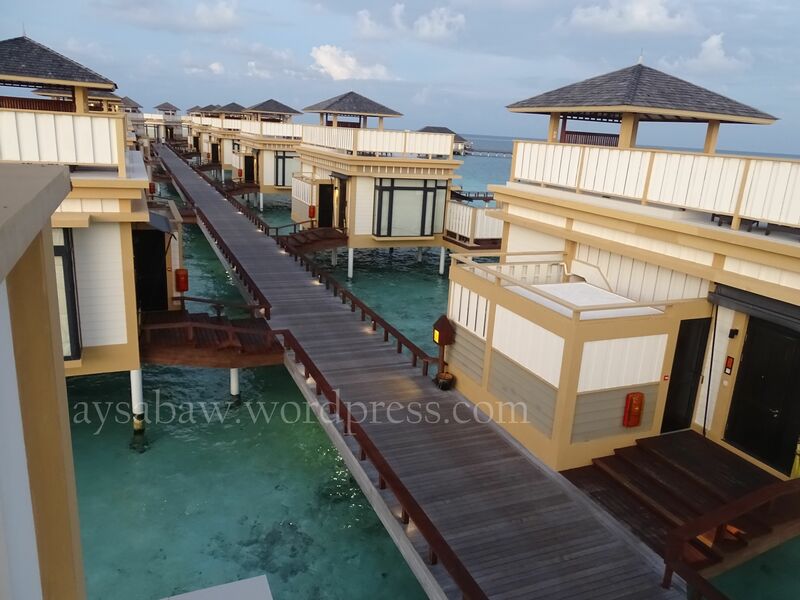 sarap naman dyan.. 🙂 may mga hoteilers tayong mga kasama dyan sa maldives..
he he dalaw ka na rin at wala naman tayong visa dyan he he.